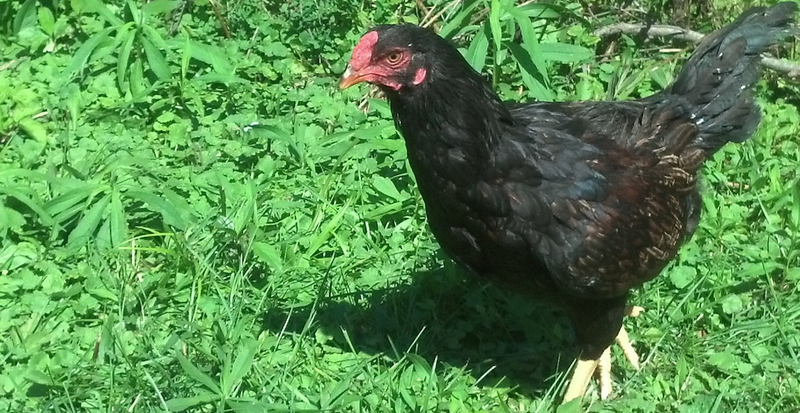 A Jumbo Cornish Cross chicken grazes nutrient rich grass pastures. Most of our chicken is sold as frozen whole or whole, split chickens ranging between four and eight pounds. Three types of chickens are grown at Cayuta Sun Farm. Jumbo Cornish Crosses are our standard meat bird. Unless otherwise stated, the poultry meats offered come from this tender variety. All of our six to eight pound feast birds are Jumbo Cornish Cross. Our egg layers are a small flock of mixed breed birds developed over 12 years. Egg surplus is limited to neighbors and close friends. You can purchase our poultry retail at local farmers markets. Farm visitors who make an appointment in advance receive a 50 cent per pound discount. We can deliver to your meat locker in Corning and Ithaca, N.Y. Our local cooperative extension has set up The Finger Lakes Meat Project to benefit both regional livestock farmers and consumers. You can also find for our products at the Corning Winter Farmers’ Market on the first and third Saturdays November through December. Look for us at the Ithaca Farmers’ Market as well. The current price for chicken, whole or halved is $4.50 per pound.